Wader, LLC is developing systems to improve the energy efficiency of coastal desalination plants, wastewater treatment plants, and industrial plants worldwide by allowing the plants to generate clean renewable energy from their waste stream. The apparatus, patented as the Hydrocratic Generator, is placed at the outflow line of the coastal plant and captures the energy generated by the mixing of salt and fresh water and returns this clean, green power to the plant for baseline power needs. 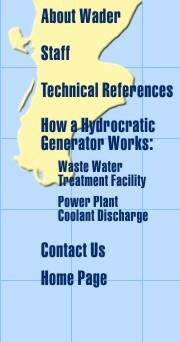 The design of the Hydrocratic Generator is simple and flexible allowing for use in many environments. The components of the device are readily available. The generator does not require the use of high maintenance membranes and generates clean energy without the use of hydrocarbons or the generation of carbon dioxide. This energy is generated continuously as long as fresh and salt water are flowing through the device. The generator also assists in the disposition of wastewater and brine from desalination facilities, wastewater treatment plants, or industrial plants by bringing the salt content closer to that found naturally in the ocean. This energy generated is called salinity gradient energy and is comparable to wave energy in the estimated power available with estimates in the range of 2,000 TWh/annum where TW is terra watt or one trillion watts. The company is ready to roll out engineered systems for trials and production. The first prototype will be tested in a typical usage situation. We envision a system designed with input from offshore oil & gas engineers that have extensive experience in structural design. To date, Wader, LLC, has tested the concept, run computational fluid dynamic analysis on early model test results, expanded and modified the device based on empirical results, field tested the device at the docks in San Pedro and at sea on the Scripps FLIP. Wader, LLC, has continued to build on intellectual property protection through patents, copyrights, proprietary data and trade secrets. The system consists of three subsystems, namely an injection system, an open vertical tub immersed in a water column and a means to extract the energy and deliver the power to shore, such as an underwater turbine and underwater power cable. The system flexibility in design allows for entry into multiple markets. 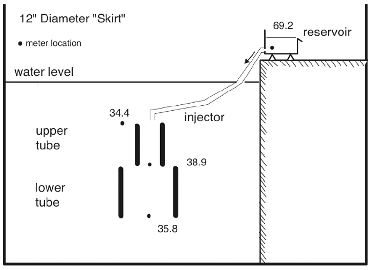 The Figure reflects the results of a lab experiment conducted by Wader, LLC, wherein brine from a desalination plant is released into the ocean environment within 4% of the ambient salinity.